Eragon, a poor fifteen-year-old farmer boy, lives in the Kingdom of Alagaësia, which is ruled by the evil King Galbatorix, a former dragon rider. While Eragon hunts in the forest, he finds a polished blue stone and believes it will buy his family food long enough to survive winter. Unable to trade the stone off, Eragon kept it. The stone hatches and a dragon hatchling emerges from it. Because dragons are supposed to be extinct, Eragon raises the dragon, Saphira, in secrecy. Two Ra’zac come into town for the stone and kill Eragon’s uncle. 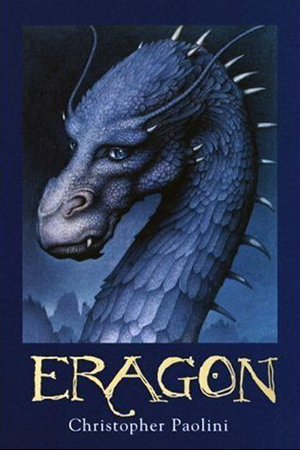 To defeat the Ra'zac, Eragon goes on a journey with Brom, a storyteller from his town. The three of them finally reaches the town where they believe the Ra’zac lives, but stumbles into a trap. Brom dies to save Eragon’s life, and Murtagh rescues Eragon and Saphira. As they continue with their expedition, Eragon starts to have dreams about a mysterious girl, who is in trouble. Eragon finally meets up with the unknown girl when he is captured. Saphira and Murtagh save Eragon and the girl from prison. When Eragon and the girl were rescued, they came across the Shade, an evil creature. As they continue on to the Varden, Eragon faces danger such as an army of Urgals chasing them the whole way there. As Eragon approaches Varden, Varden and his allies prepare for Urgals to appear from the mountains. During the battle, the Urgals nearly kill Varden until Eragon defeats the Shade he ran into before. The battle with the Shade leaves Eragon in pain. As Angela heals him up, Eragon remembers what a figure in white had said. The figure, Togira Ikonoka, has all the answers Eragon could ask. When I first started reading this book, the plot moved slowly, which I did not relish. However, as the book established more tension and action, I started to grow fond of this book. There was barely any action in the beginning third of the book, but toward the end of the book, it had too much action, which I do not particularly enjoy. Despite the structure of the book, the author uses descriptive words to create intense pictures in my mind. Through the vivid pictures the author painted in my mind, Eragon transforms from a poor farm boy to a strong, fierce dragon rider in the end. After finishing every last page of this book filled with action, I recommend Eragon for ages 11-15 due to some violence and some harder to understand vocabulary. Even though the structure of the book was not written too well, I would give this book eight stars out of ten because I loved how the storyline was written. 1. What was the first word the dragon, Saphira, thought? 2. Where does the name Saphira come from? 3. Why was Saphira worried about Eragon? 4. What is an Urgal? 5. How do you find your true name? 6. Who has a great fascination and passion for the ocean? 7. Who does Eragon say is crazy? 8. What was Eragon never taught to do? 9. What is Eragon looking for in the scrolls? 10. Where does Eragon find Ra’zac’s lair? 11a. Saphira is excited because she has space to fly, things to hunt, and the warm weather. 12. How does Murtagh assure Eragon he is not working for the bad guys? 13. Why is Eragon confused when two people appear at the doorway? 14. Who was waiting for Eragon at the dragonhold? 15. Where do the Urgals come out from?